In May 2012, Shane Bennett sent a message to Samsung via Facebook. The 26-year-old spiced up his inquiry with a drawing of a dragon in hopes of securing a free gadget hookup from the tech giant. Bennett was amused at the company’s clever reply. So, naturally, Bennett posted a screenshot of the conversation to Reddit. 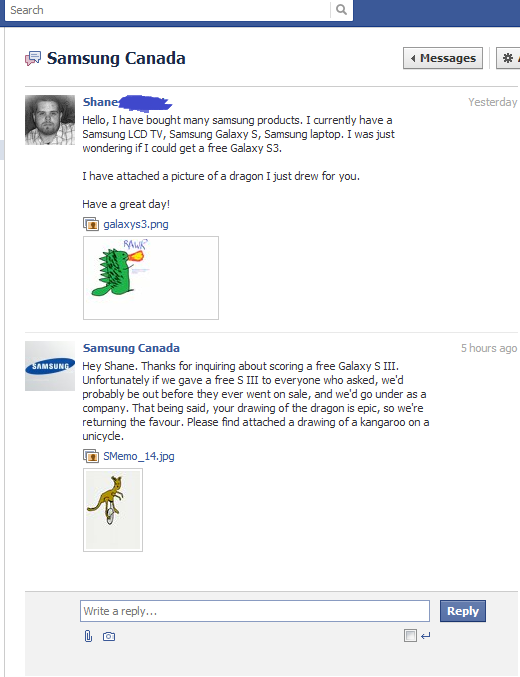 Early this week, Bennett received his free Galaxy S III, personalized with his original dragon drawing. He shared a photo of the letter and his new phone to Reddit as well. 2012년 5월, 삼성 제품을 많이 구입한 Shane이라는 고객이 갤럭시 S3 무료 제공을 요구하면서 공룡 그림을 그려 전달함. 삼성 캐나다 페이스북 담당자가 고맙지만 다른 분들 또한 무료 제공을 요구할 수 있으니 거절. 그냥 거절하기 미안해 Shane의 공룡그림에 대해 외발자전거를 타는 캥거루 그림으로 보답하는 센스 발휘. 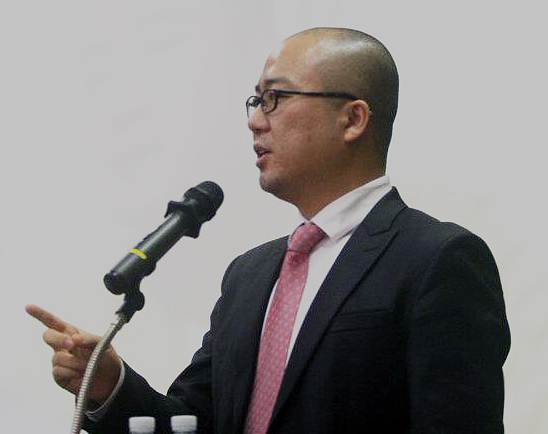 삼성 캐나다의 답변에 호감을 느낀 Shane은 이 글을 여러 커뮤니티에 올림. 덕분에 상당한 마케팅 효과를 얻은 삼성이 그의 드래곤 그림이 그려진 한정판 갤럭시S(Galaxy S III, personalized with his original dragon drawing / This is the only customized S III)를 무료로 보내줌. 갤럭시 3 런칭 파티도 초대됨. 마케팅은 Think Different 해야 한다. ※ 이 글은 총 5회 조회되었습니다.